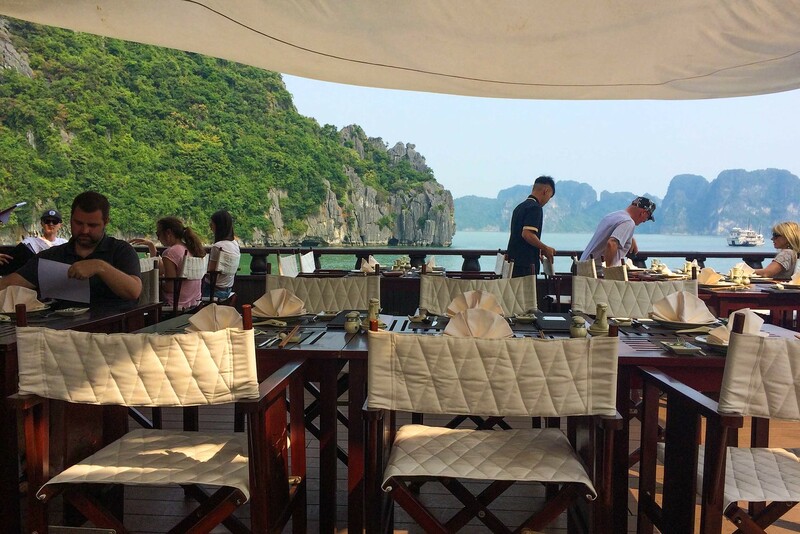 We’ve just returned from our second visit to the wondrous and beautiful Halong Bay with Indochina Junk, and it was just as special as the first time! If you’re wondering what it’s like to cruise Halong Bay with Indochina Junk, then read this detailed review. From the ship facilities, to excursion experiences, we cover it all (including our best photos and videos)! Please note, we were invited back to Halong Bay by Indochina Junk to work in partnership with them, but as with everything on Worldly Nomads, our opinions remain our own! When we researched our first trip to Halong Bay back in 2012, we were overwhelmed by the huge number of options available! 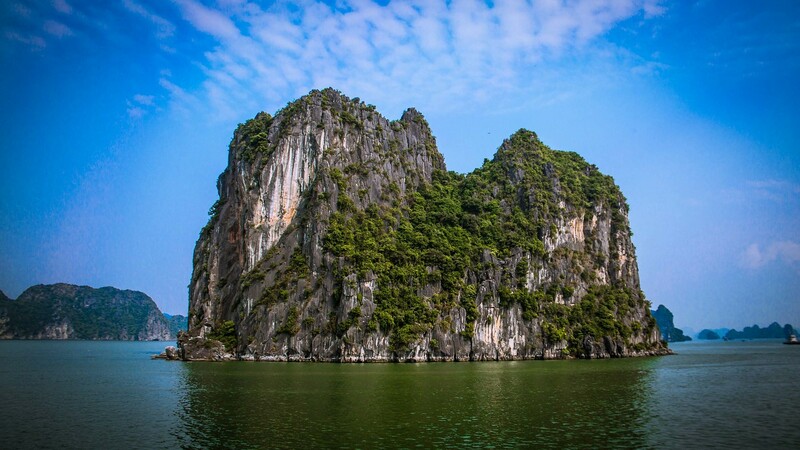 How long should we spend on Halong Bay? What kind of tour? What type of boat? Which company is the best? With so many conflicting reports online, our next best option was to take advice from some fellow travellers. They were quite insistent that we go with Indochina Junk, and that we’d have an amazing experience. So of course we took their advice, and well, it was soooo good that we left desperately wanting to return some day. Luckily that dream came true last month, and we’re now reporting back on our second incredible trip with Indochina Junk! 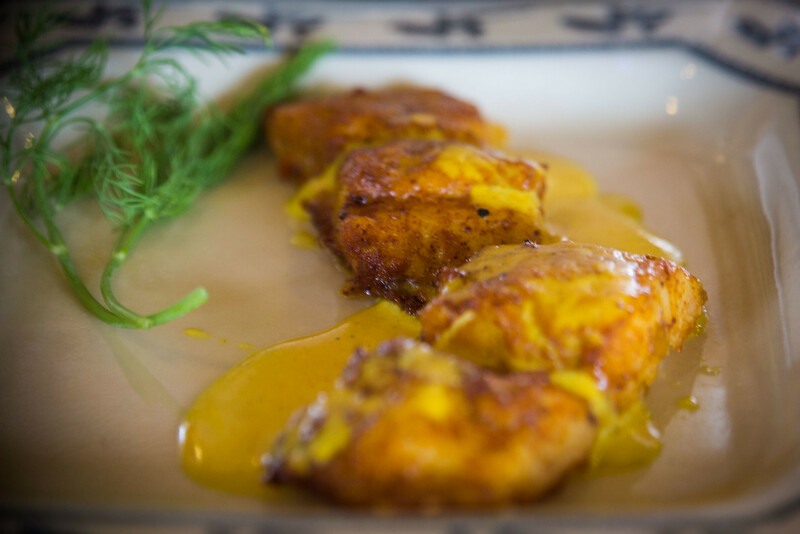 From the extremely fresh and delicious food (some of the best we’ve ever had and that’s no exaggeration! ), to the incredibly friendly and professional staff, we absolutely loved everything about our Indochina Junk tour and would highly recommend them to anyone. So for more details and what to expect, covering everything from the ship accommodation, to the food and kayaking excursions, this is a full guide. However before delving in, have a quick look at our short documentary video from our recent 3 days/2 nights cruise on their newest and very beautiful Dragon Legend cruise ship! 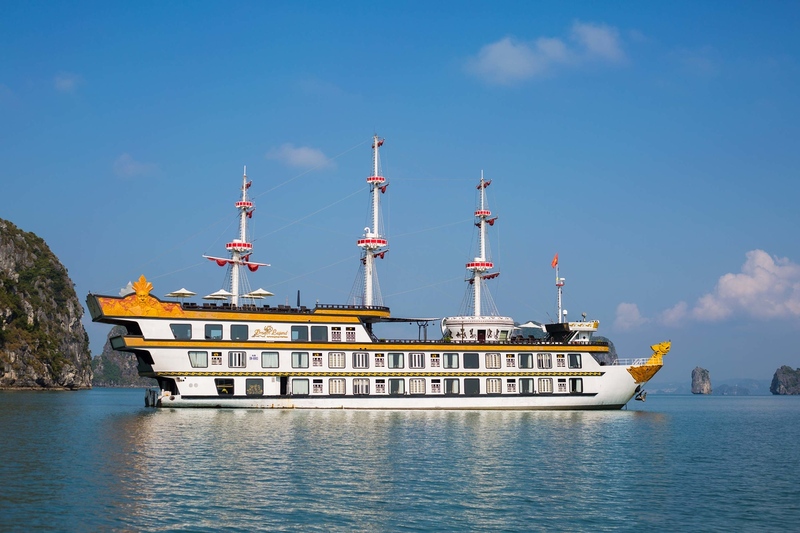 What To Expect From Indochina Junk’s Dragon Legend Cruise? Our room onboard the ‘Dragon Legend 2’ cruise ship was complete luxury and totally exceeded our expectations! 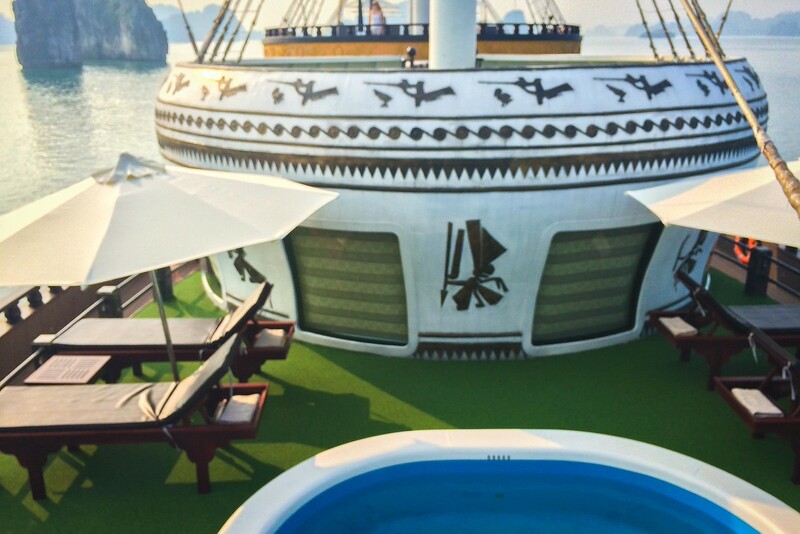 We’d been told that this new ship was a class above the ‘Dragon Pearl’ ship (the one we chose for our first adventure to beautiful Halong Bay) but we didn’t expect it to be quite so opulent! 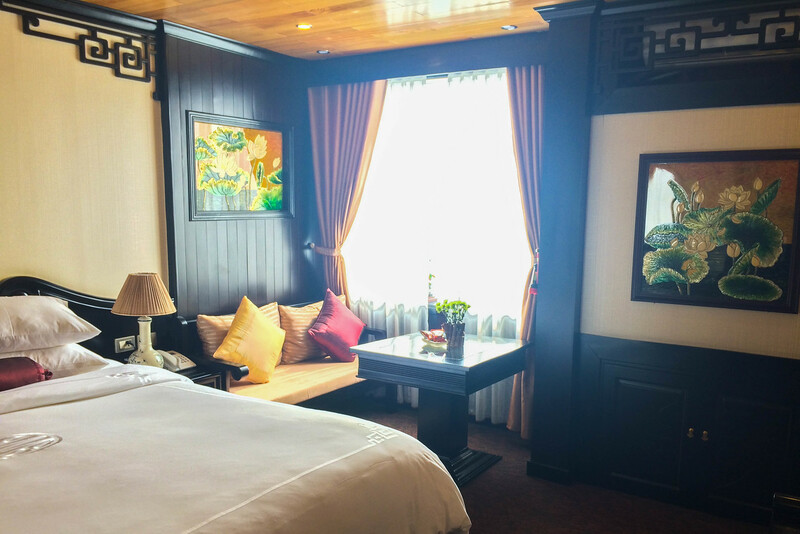 With traditional wood panelling and carvings, the rooms (as well as the rest of the ship) are full of authentic and tasteful decorative detail. It’s no wonder the ship took 2 years to build! We also had LOTS of space and even our own little living area with a great big window which was perfect for enjoying the beautiful views from the comfort of our room! Our cosy living area and big window! 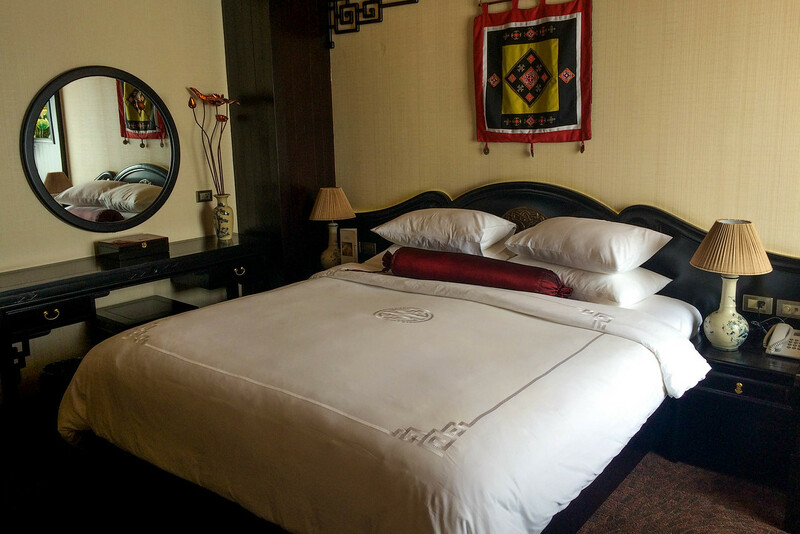 We’d got used to the usually hard mattresses in Vietnam, so it was a very welcome change to have a luxuriously soft mattress! I also appreciated having a lovely dressing table with mirror for getting ready and plenty of wardrobe space (a luxury I wasn’t used to during our travels!). The rooms also have A/C, a minibar and TV (not that you’ll have much time to watch it!). Then there’s the bathroom…wow. 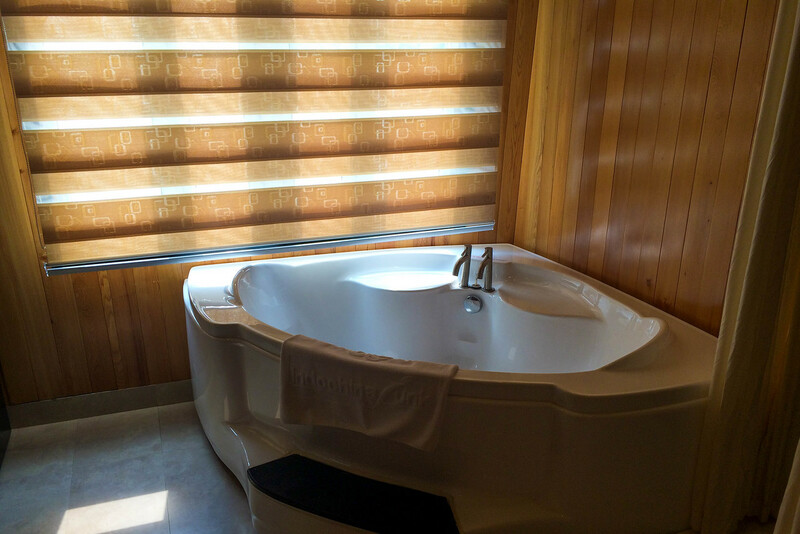 Again we had a lovely big window so that we wouldn’t miss the views, but what we didn’t expect was the large jacuzzi-style bath, complete with separate shower and a hot towel rack! Naturally I was desperate to get into the bath to enjoy the novelty of admiring the bay views from my bubbles…yep I was in heaven. In fact writing this now makes me wish I was there again! Enjoying the views from my bath! 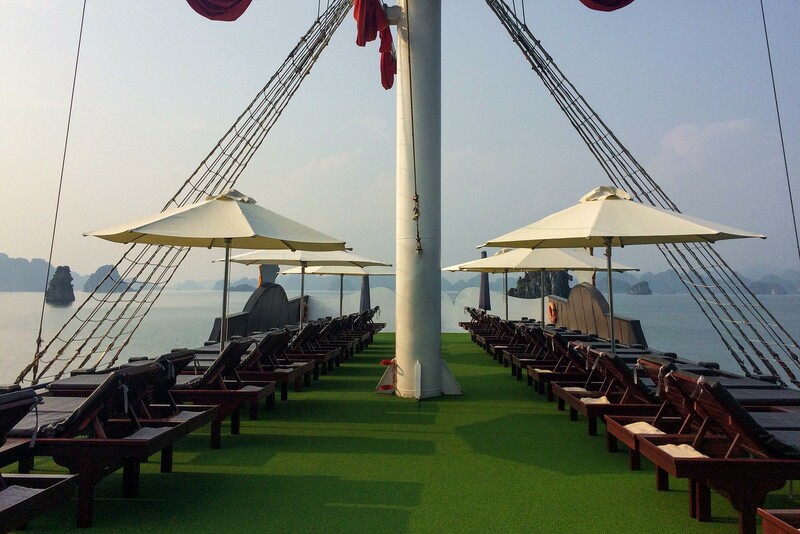 The ship also features a beautiful sundeck area complete with a small but lovely pool and spa. 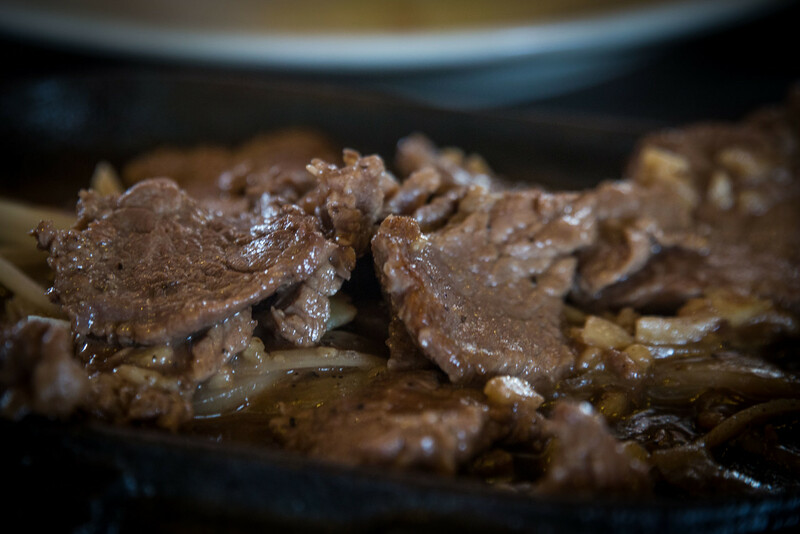 The standard of food on the ship is some of the best we have ever experienced, and that’s no exaggeration! 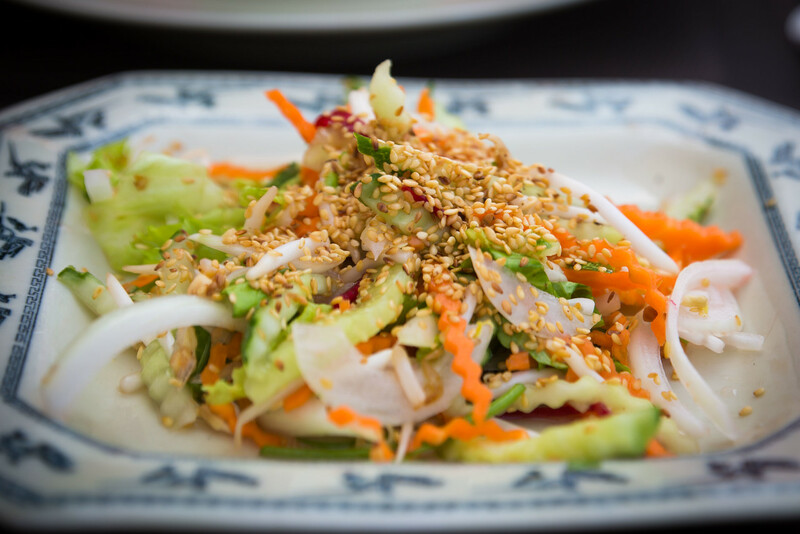 It’s no secret how much we love our food when we travel, especially Vietnamese cuisine (hence why we returned for more!) 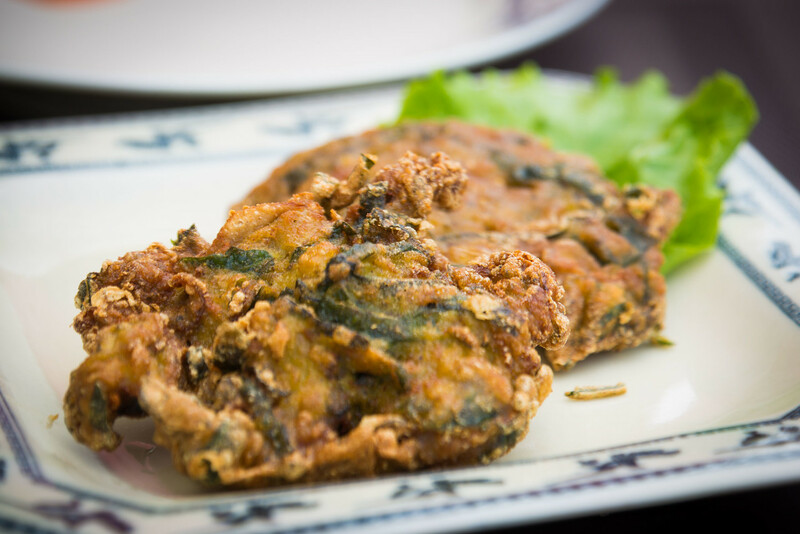 however the food served on the Dragon Legend (and the Dragon Pearl on our previous trip), was really amazing! 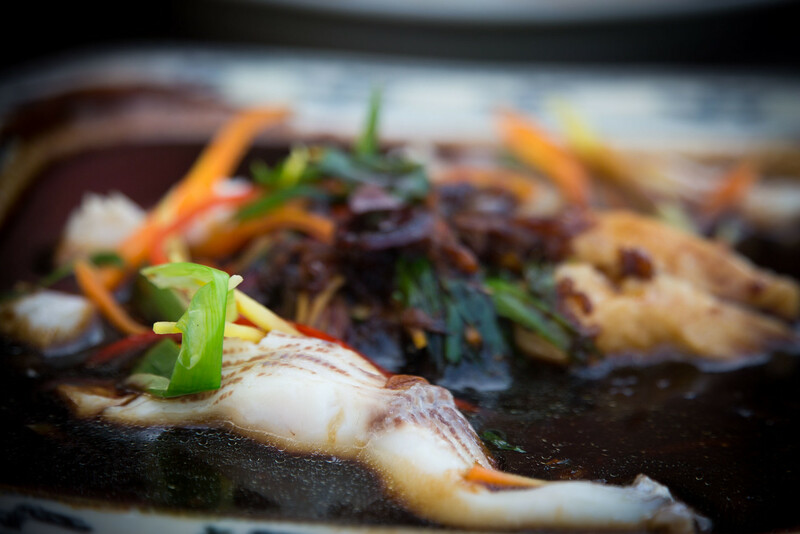 Not only is it all absolutely delicious and freshly prepared, the variety is incredible. 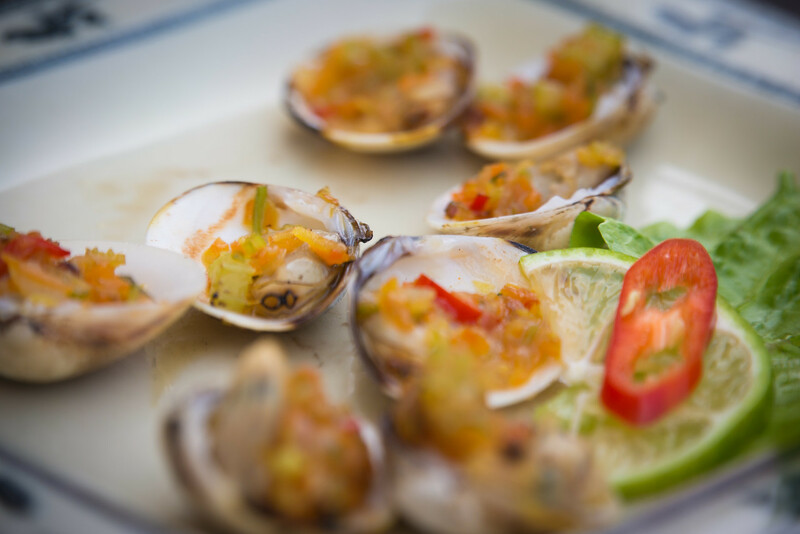 Expect to eat everything from fresh crab, clams, tiger prawns, deep fried oysters (our new favourite! 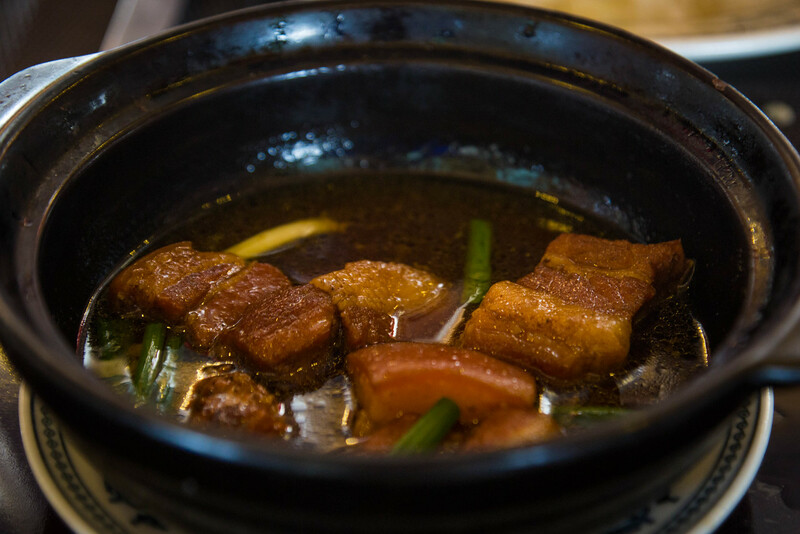 ), stewed pork in hotpot to traditional chicken noodle soup (Pho Ga). 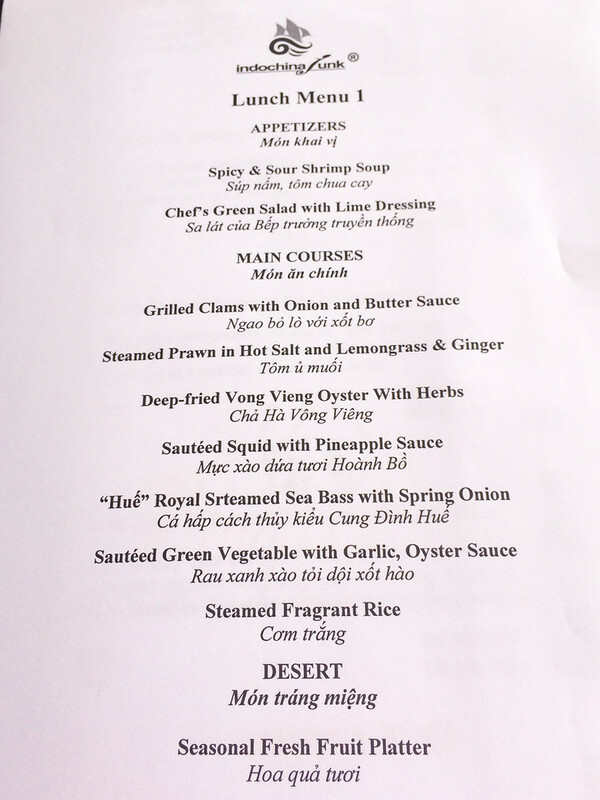 Here’s a sample of some of the most delicious dishes we were served! Just be prepared for LOTS of courses so each meal takes some time! 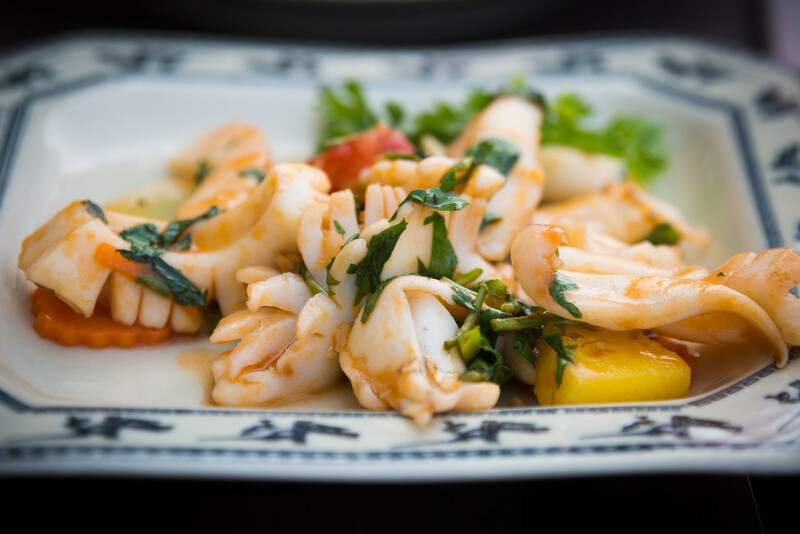 But you really won’t mind that when you’re being served the most delicious food whilst sailing passed awe-inspiring views of endless limestone karts and islets! 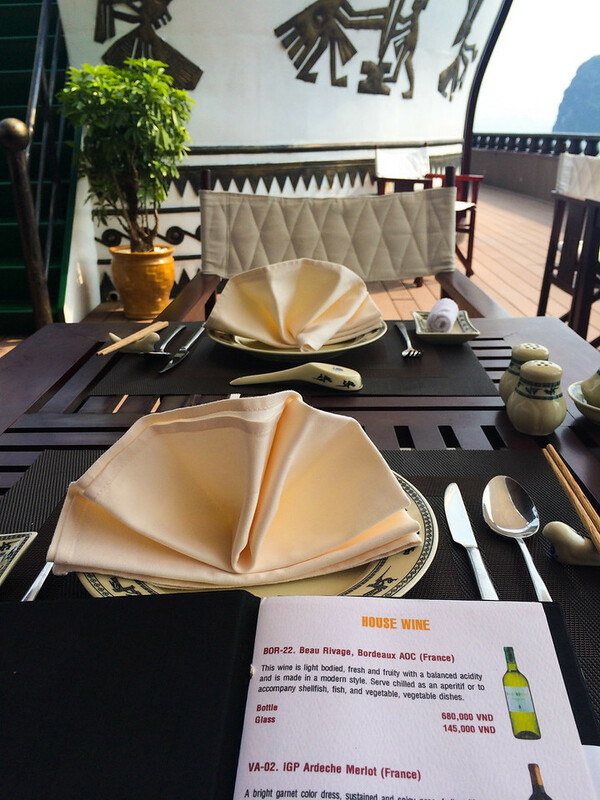 There are 2 dining rooms on the Dragon Legend ship, outdoors and indoors. Providing you have good weather, you’ll be served most of your meals at the beautiful outside area where you have uninterrupted views, however the inside dining area has big windows also allowing good views. The same goes for the bar which has both an outdoors and inside option. If you’re lucky you’ll be welcomed by ‘Harry Potter’, nickname of the witty and confident head barman on the Dragon Legend 2. Just like all the staff on the ship, he is eager to please and will make sure he makes you the ‘perfect’ cocktail!! 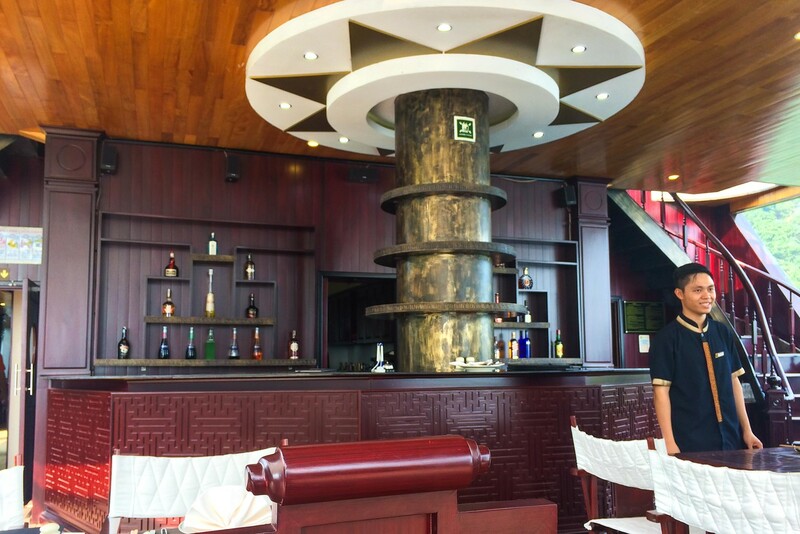 The bar is also well stocked, so you’ll be sure to find your perfect sundowner tipple! 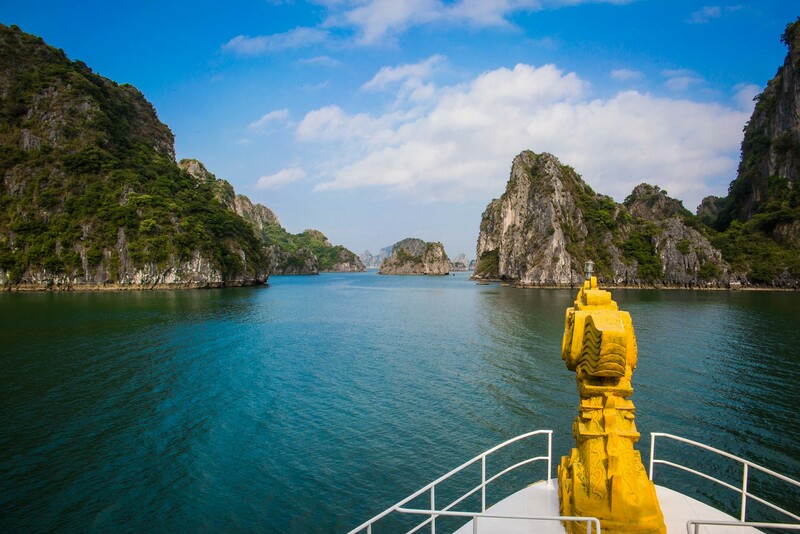 Sailing around beautiful Bai Tu Long Bay (the quieter part of Halong Bay) on the Dragon Legend ship is just one amazing aspect of the cruise, and would be reason enough to visit! However, it’s the excursions that really make your trip, as these are the moments you get to discover this incredible place for yourself, and also get a little closer to the amazing towering limestone karsts and islets! 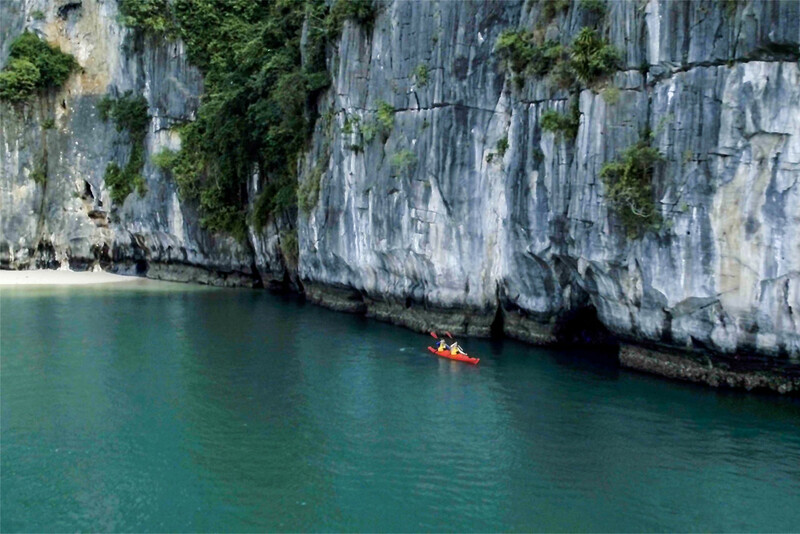 We took several kayaking trips during our 3 day/2 night cruise with Indochina Junk, the highlight of which was visiting this secret lagoon which involved carefully navigating our way through a dark limestone cave…it was so exhilarating to get inside! 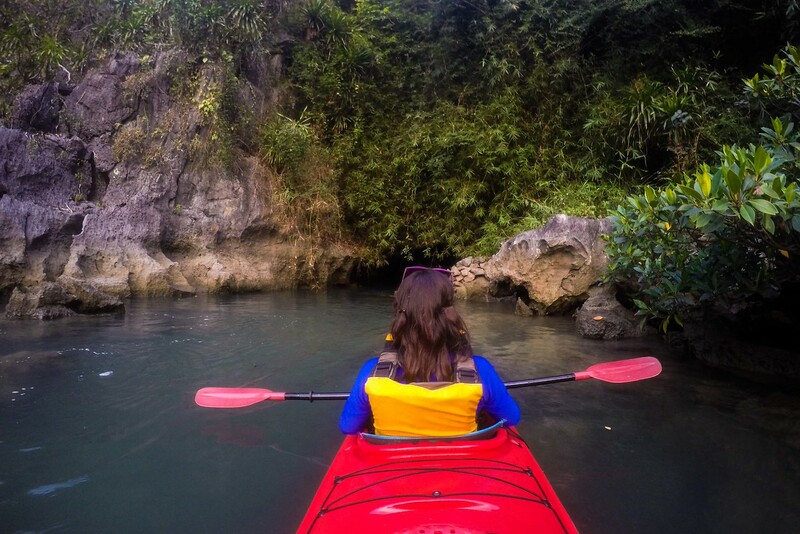 Kayaking in a secret lagoon! Another amazing feature of the bay is the wildlife. Once you get up close to the karsts on your kayak, you can see lots of little crabs and sea creatures crawling over the rocks. Looking up, you’re likely to see the most beautiful eagles soaring above you, as well as many beautiful butterflies fluttering passed. It’s quite amazing! We also got the chance to visit this beautiful floating village and tour around it on a little rustic rowing boat with a local guide. It was a very peaceful way to appreciate the stunning views and learn about the fascinating way of life on this part of the bay. Imagine living here! 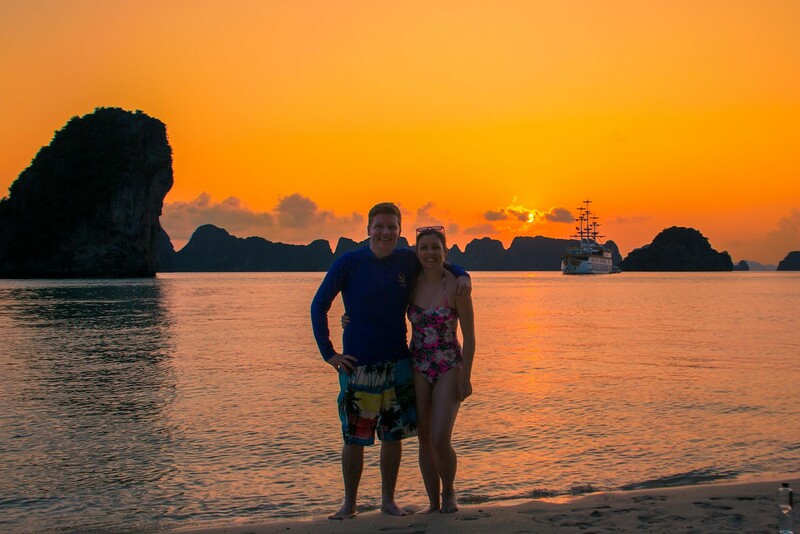 The sunsets over Halong Bay are like no other, and we enjoyed our excursion to this private Indochina Junk beach where you can swim and admire the amazing sunset! For more images and a video of our excursion highlights, take a look at our highlights video over in our full Bai Tu Long Bay experience article. 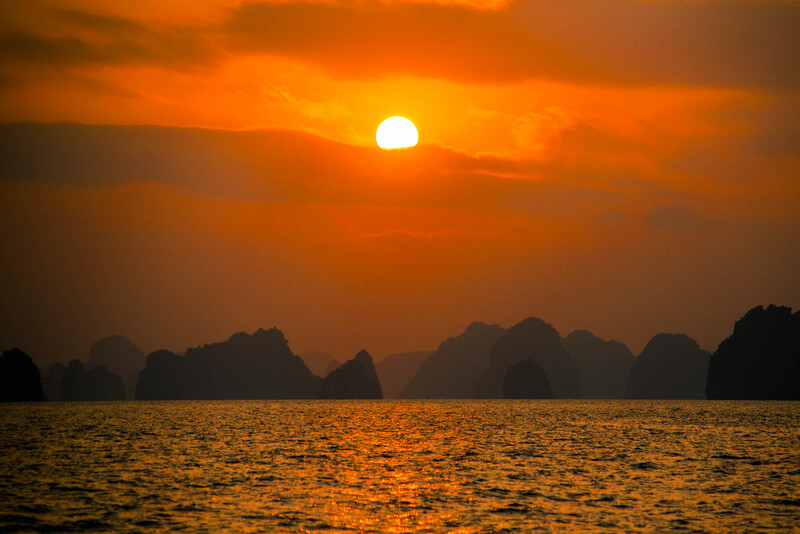 As you’ll see from our video, the huge advantage of sailing with Indochina Junk is that you’ll hardly see any other boats on your journey, as they have private access to some of the most beautiful parts of the area, making the experience even more peaceful. 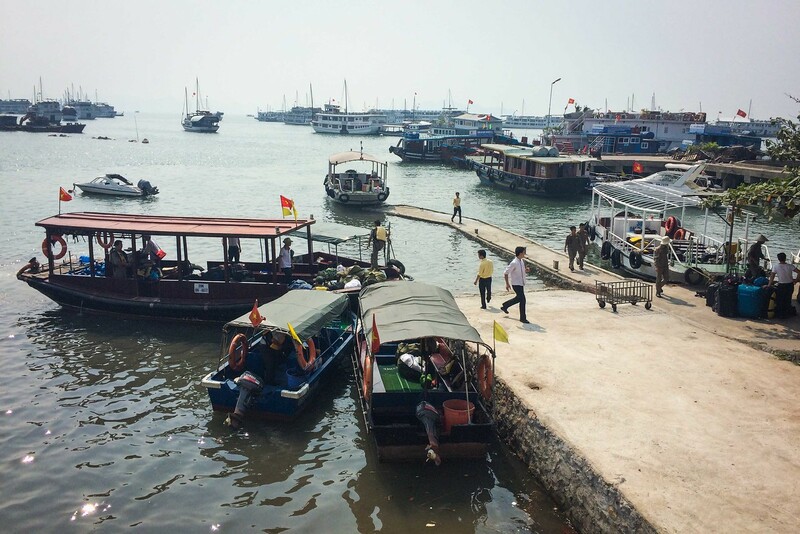 The journey from Hanoi to Halong Bay takes around 4 hours (sometimes longer depending on traffic), including a toilet break around halfway at a large factory where you can pick up a snack or souvenirs too. 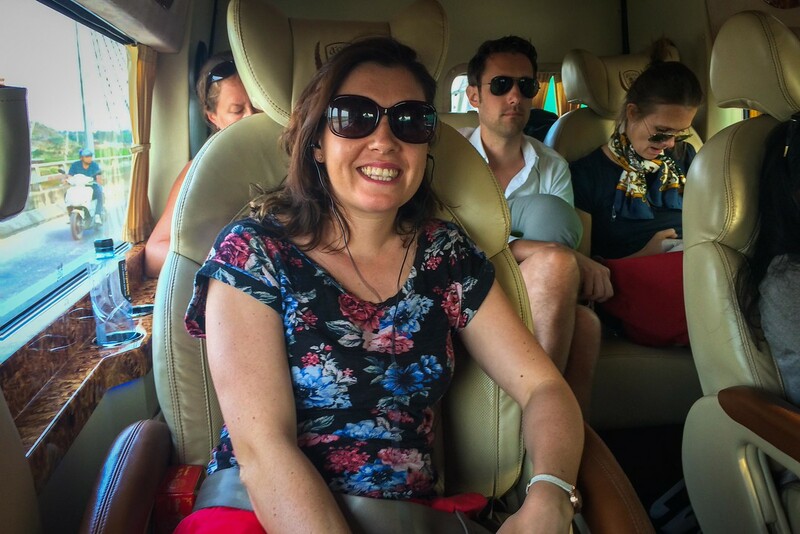 Included in your tour price is pick up and drop directly from your hotel in Hanoi, and the air-conditioned vans used are very comfortable with free water provided. This was one of our transfer vehicles. Nothing will prepare you for the crazy traffic on the roads, but that’s normal for Vietnam! All our drivers drove very safely, putting us at ease on the journey. It’s amazing to watch what the locals transport on the back of their motorbikes along the way, so just sit back and enjoy the view. We even saw one guy carefully balancing 6 huge tree plants strapped around a sack of rice on the back of his – incredible! 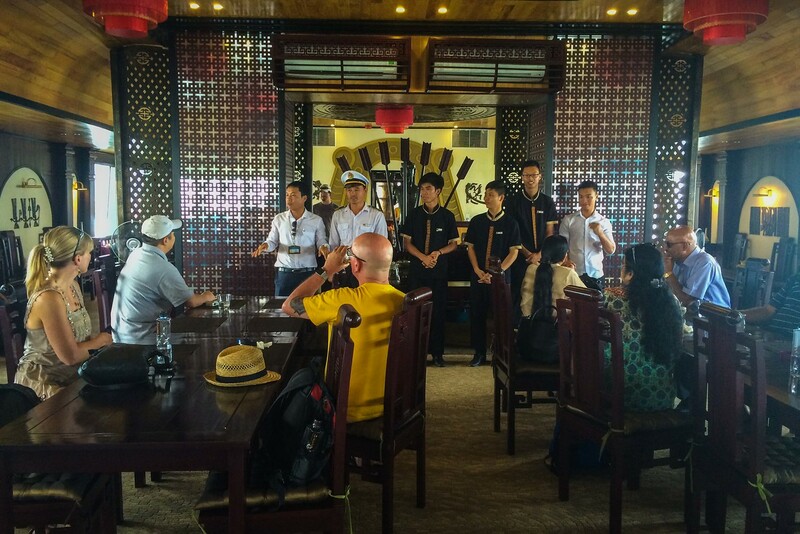 Once you arrive to Halong Bay, you’ll be welcomed by the lovely Indochina Junk staff and ushered to a nice cafe style waiting area where you’ll meet your tour guide and the rest of your fellow travellers. There’s also free wifi, water and toilets there. After a brief introduction, it’s time to board the small transfer boat to the ship. This is where it gets exciting as you’re finally on the bay for the first time and about to get your first glimpse of the ship (and your home) for the next couple of days! Last but not least, here are some of the wonderful staff of the Dragon Legend Ship! There’s no doubt that you’ll have a great guide to accompany you on your tour, and the rest of the staff are also fantastic. We couldn’t fault the service. From the food and drinks, to the excursions and cleaning of our room, everything was perfect and ran like a well-oiled ship (sorry for the pun!). 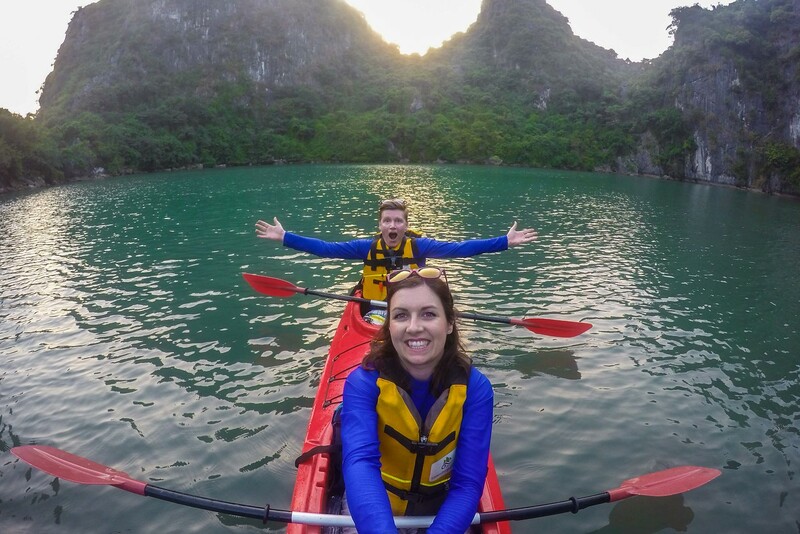 You may already be familiar with the negative stories about some Halong Bay cruises, such as rat-infested boats, boat traffic and polluted waters, however this is why we’ve shared our amazing experience in detail! Be assured that there are brilliant options for cruises on Halong Bay, especially those provided by Indochina Junk, who we highly recommend! Wow guys, beautiful! We decided to skip Halong Bay despite spending 6 weeks in Vietnam, mostly to have a good reason to be back. Can’t wait!! Thanks Jenia glad you liked it! 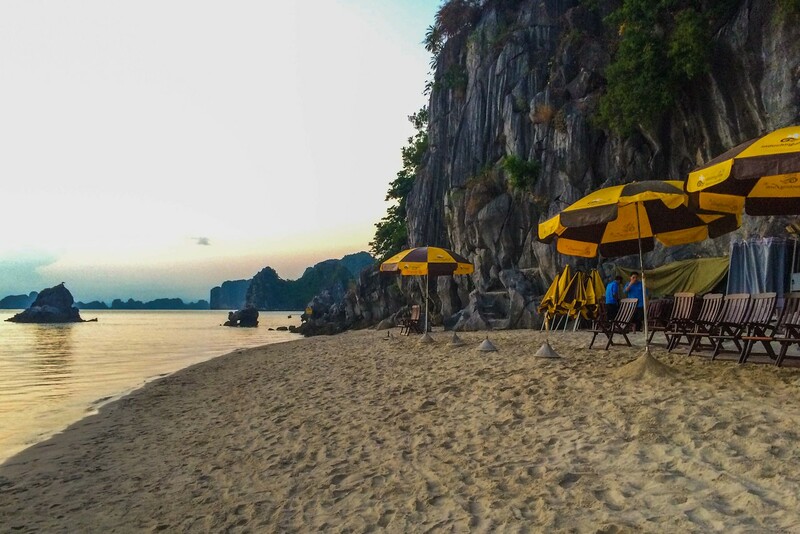 Halong Bay is worth the wait! What kind of camera are you guys using? You have some excellent shots here. Thanks Frank! For this trip, we were mostly using our Canon 5d Mark 3. Hi Madison, we took this cruise at the end of October last year and the weather was good so I imagine it wouldn’t be too different in November. It certainly wasn’t cold at all so we enjoyed all of our meals on the outer deck. We’ve heard it can be hit and miss with storms at that time of year however so you do need a little luck! Fingers crossed for you! Thanks so much for sharing this! I am looking forward to an IJ cruise later this year. What additional expenses should we expect on board, whether that be for food or drink or anything else? Hey Noah, glad you found this helpful! 🙂 How exciting you’re going on an Indochina Junk cruise…they are so amazing!! In terms of additional expenses, everything was included with the exception of alcohol and soft drinks (from memory!). You’ll be supplied with beautiful meals and plenty of drinking water with them, and tea/coffee is also included with breakfast. Hope that helps & that you have a wonderful trip! Wow! Thank you for such an informative piece! We are looking to do an overnight cruise next month and have heard such great things about Indochina junk! 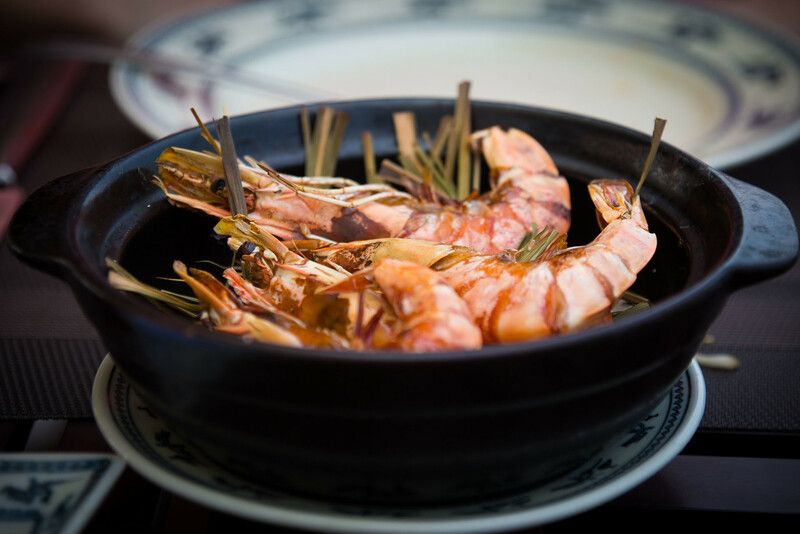 We were originally thinking to go on the Dragon Pearl cruise but this blog has certainly tipped our boats (sorry not sorry for the pun). May we ask how much you spent for the tour for both and whether you would still recommend the Dragon Pearl if it’s significantly cheaper? Thanks again for your advice! Hi Naomi, glad to be of help! 🙂 So in attempt to help with your decision making, first of all, we would highly recommend Indochina Junk in general as both tour/boat options are excellent. We enjoyed both but for different reasons, so it really depends on what you’re looking for. With the Dragon Pearl, it is a more intimate experience with it being a smaller boat, therefore, your group size is likely to be around 16 people max compared to the bigger Dragon Legend which can sleep around 30-40 (from memory!). 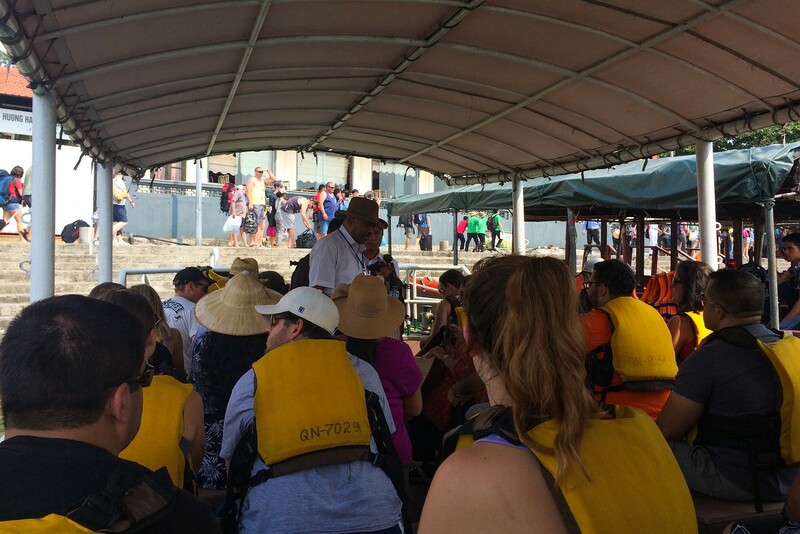 We enjoyed getting to know our fellow passengers on the Dragon Pearl. 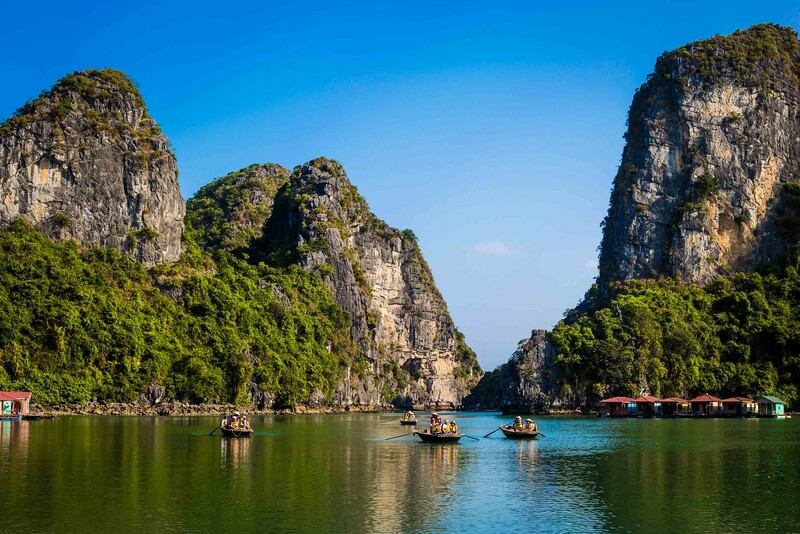 However the Dragon Legend is that bit more grand and has the wow factor….though of course you are really there to enjoy the natural beauty of Halong Bay so to many people this isn’t as important. The food and service will be equally as good on both however! The itinerary may be slightly different on each one so I would recommend looking into the up-to-date detail of that on the Indochina Junk website, as it may have changed since we went. Well hope that helps a little & good luck with the decision making. Regardless though I’m sure you’ll have a wonderful time! Enjoy! Thank you!! That helped a lot! So much so that I’ve now paid the deposit and booked the Dragon pearl – looking forward to the intimate experience you described!! That’s great Naomi! Glad we could help and hope you have a wonderful time! How exciting!